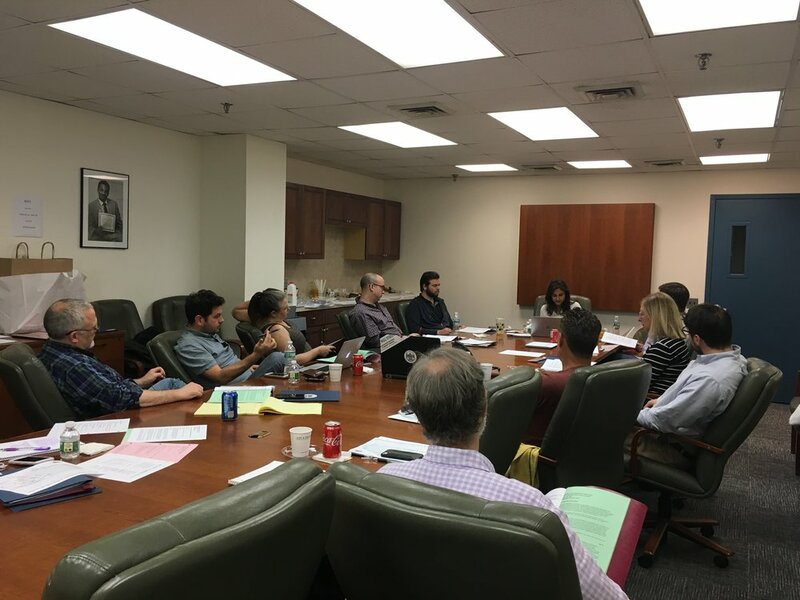 In its latest marathon session, IAPE’s board gathered at the headquarters of NewsGuild of New York for a weekend of intense discussion about the new contract we’ll soon negotiate with Dow Jones. The Apple News deal has been top of mind for all our directors, and union representatives quickly followed up on the announcement with a meeting with company officials to raise our concerns about the potential hiring of contract workers as a result of the agreement. As the June 30 end of our contract term nears, our officers and directors have been talking to members in their locations and departments to get a better sense of what your priorities are for our next contract—and where you’ve been feeling the pain with our current collective bargaining agreement. If you haven’t already, please take a few minutes and answer our surveys on health care, hours, performance evaluations and 360 reviews. Members in news and sales, you’ve also received from IAPE questions we are hoping will provide important context to the requests we’ll make to Dow Jones in the upcoming round of negotiations. In addition to pay and advancement, we are also looking into how we can bring to the table items such as the recent changes to the travel and expense policy. Please contact your representative to learn more about collective bargaining or if you would like to get involved. Guild Election, Get in Your Ballots! By now, all IAPE 1096 members in good standing should have received their ballot for the election of NewsGuild-CWA president, the first at our parent union in 11 years. Incumbent Bernie Lunzer is facing challenger Jon Schleuss for the top position in the guild. Included in the voting packets sent to each eligible voter’s home address are: a paper ballot, a blank inner envelope, a return envelope and an information sheet. The NewsGuild’s election committee will tally votes in Washington on May 13, so please get your ballots in by the first week of May to make sure your vote is counted. If you have spoiled your ballot or need a new one, please reach out to IAPE’s election committee. Please visit the IAPE website to read candidate statements and for more information about the election. IAPE’s board has chosen not to make an endorsement for either candidate in this election. Please reach out to your rep if you have any questions. Join one of our information sessions later this month to learn more about what these committees do and how you can get involved. Princeton: Tuesday April 23, Beijing Conference Room (Second Floor) 2:30 p.m. - 3:30 p.m.
New York: Wednesday April 24, Midtown Conference Room (Fourth Floor) 1 p.m. - 2 p.m. Interested? Email union@iape1096.org with “steward training” in the subject. You can always reach the union office at union@iape1096.org . But we all know Tim is only one person, and while we do have a new admin assistant, Meredith is only part-time. Sometimes it's quicker to email someone closer to you. And here’s more information on how to reach reps and stewards in your location. The Wall Street Journal last week announced plans to hire some 50 newsroom staffers to meet the needs of its partnership with Apple Inc.’s new subscription product. The news of the hiring spree thrilled IAPE, which has been run by and for the employees of Dow Jones for more than 80 years. But many of those new positions will potentially be filled with contract workers, according to job postings by the company, undercutting the union protections and benefits afforded to the 1,250 union-represented employees at WSJ, and its parent company. This news of a potentially drastic increase in contract reporters—in effect the creation of an unprotected newsroom—deeply troubles IAPE. 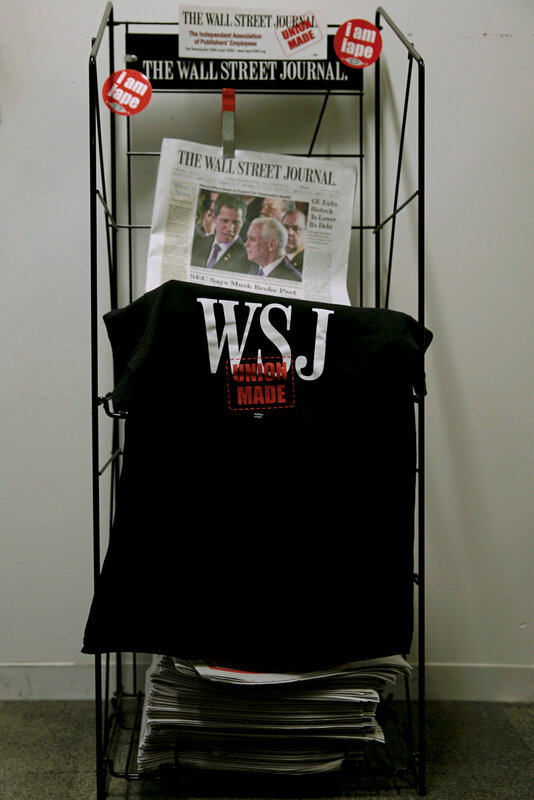 Reporters at The Wall Street Journal, Barron’s Marketwatch as well as others represented by IAPE receive a variety of benefits through its negotiated collective bargaining agreement, including health care, paid time off, lay-off protections and the right to have a union representative present during disagreements with managers. These benefits support the staff who help produce some of the finest journalism in the world, and IAPE believes these protections should not be eroded in connection with a partnership with an outside company. IAPE calls on WSJ Editor in Chief Matt Murray and Dow Jones Chief Executive William Lewis to publicly guarantee that no unprotected newsroom will be created through the Apple deal. -The gender pay penalty persists. -Dow Jones needs to make considerable progress on minority hiring. -What can you do? Get a pay review, join the discussion and reveal your salary to colleagues. One-sided pay discussions help patterns of unequal pay continue. But as a union member you don’t have to go it alone. You can learn confidentially where you stack up among colleagues of similar age, experience and duties as you. We don’t share names or provide reviews for groups smaller than six. In the union’s three years offering our members this service, we’ve heard back that Dow Jones will dispute our comparison, even when going on to offer raises to those who sought to find why their pay was so askew. It’s become increasingly popular and socially acceptable to talk openly about salary with your colleagues. Transparency is an important step to helping call out pay inequity and sharing your pay information with your colleagues can help. Read more about the data behind the union’s analysis and the company’s response to our findings. For years the union has held the position that rating the performance of employees is a management function and that self assessments, in particular, should be considered optional. In our continued effort to empower members to ask for the compensation they deserve, we want to re-examine our stance to reflect the reality of the salary negotiation process here. We also want to increase transparency around all the metrics that may be used to determine your value at Dow Jones, whether they have a dollar sign in front of them or not. That the numeric score on your performance evaluation could be given considerable weight in whether you will ultimately receive a salary increase beyond the minimum annual raise required in our contract isn’t necessarily surprising. And we agree employees should be rewarded for great work with higher pay. Though after hearing from members that the 1-5 numbers assigned for work in the previous year don’t always reflect the full scope of their accomplishments, we want your feedback on how the union should guide members on performance reviews going forward. The spring 2019 meeting of the IAPE Board of Directors will be held March 30 and 31 in New York City. Our current contract expires at the end of June and elected directors from across IAPE will be meeting (or dialing in) to discuss negotiations with Dow Jones for our main bargaining unit. As always, there will be an opportunity for membership comments—and members in the NY/NJ area are encouraged to attend. This meeting will be held at the headquarters of The NewsGuild of New York, 1500 Broadway, Suite 900. If you are interested in attending in-person, please reply to this email with BOARD MEETING in the subject. If you aren’t able to join us, or if you live and work in other locations, you may deliver comments via email, which will be read (with your permission, of course) into the record. Please feel free to contact your area director, or submit comments to union@iape1096.org. How can eligible members vote? Paper ballots will be sent to the home address for eligible voters, including a stamped envelope for return. When will the winner be announced? Votes will be counted and a winner certified the week of May 13. When Dow Jones came to the union last year to ask us to sign off on switching our members to the new Virgin Pulse fitness benefit, our board’s response was unanimous—NO. Citing major concerns over data privacy as well as the consistent move toward concierge-type benefits that are more complicated and time consuming to use, the union told the company we would rather stick to the less intrusive reimbursement program we’ve had for years. And that any further changes would have to be discussed at the contract bargaining table. The outpouring of support from non-union colleagues for our decision has confirmed that we must continue to fight against the company’s rationale of commoditizing private health information, even if it saves money on a popular employee benefit. We agree there is often a direct relationship between more money and an increased sense of wellbeing. We suggest management focus on improving pay practices rather than having workers re-earn a benefit they are entitled to as a result of being a Dow Jones employee. Should my colleague be in the Union? IAPE regularly works to help correct the classification and union status of employees who have been incorrectly excluded from our bargaining unit. We are in constant discussion with Dow Jones about what titles should be covered by the bargaining agreement and want to help those who are improperly excluded from union coverage. If you think a coworker in your department is performing duties in line with other union colleagues, please contact us. Union membership comes with considerable benefits. Non-union staff are often denied holiday pay, comp time and the right to representation in disciplinary meetings, among other important protections. Ensuring people are properly classified -- and where appropriate, covered by the union agreement -- leads to better seniority protection and job security for all employees. It also helps the union’s effort toward securing fairer pay practices at Dow Jones. Email IAPE Executive Director Tim Martell to see if your coworker might qualify for union protection. With stagnating wages and increasing health care costs, we know that saving more money is a top priority for most of our members. No matter where you fit into our negotiated tiers and pay scales, bringing a healthy homemade lunch to work is one of the best practices you can start in the new year. Join our Brown Bag tier lunch group the second Tuesday of every month at the Princeton office. You’ll have a chance to meet union representatives and fellow members while learning more about the union, our contract and the collective bargaining process. IAPE members and their families have access to scholarship opportunities through our affiliates. The deadline to apply for the UnionPlus scholarship for 2019-20 admissions is Jan. 31 and April 30 for CWA’s Joe Beirne scholarship. IAPE’s board at the New York City Central Labor Council in new york. On Tuesday, members received letters from CVS stating that, starting in January, they'll need to fill all of their reoccurring prescriptions thru CVS or Caremark, their mail server pharmacy, or be forced to pay the full cost of the medication. Dow Jones has explained to IAPE that, “the 90-day supply rule for maintenance drugs is already part of our prescription drug plan, but we have not been enforcing it.” Starting in January, Dow Jones plans on enforcing that component. We suspect many members have valid reasons why they choose to use pharmacies other than CVS. If you think this change will cause problems for you, please let us know. IAPE’s Union Made event returns with Bonds: On Relationships columnist Elizabeth Bernstein, who will join Vice President Mike Wursthorn to discuss sourcing real people for all types of stories, including sensitive topics such as sexual harassment. Drinks and appetizers will be served at this members-only event and there will be an opportunity for networking after. IAPE’s is bringing back our popular trivia contest to encourage members to learn more about our contract earn a chance to win some money in the process. The rules are simple: each Friday, we will email a contract question to the IAPE membership. Members in good standing* will have one week to find the answer within the current collective bargaining agreement between IAPE and Dow Jones (or our weekly Slack Q&A transcripts, and email that answer as a reply to the emailed trivia question. The following Friday, one winner will be selected at random from all the correct responses, and that winning member will receive a $50 gift card from IAPE. And don’t forget to join us on Slack! A reminder that our live Q&A session will take place at 1 p.m. EDT Friday on the IAPE Slack account (iape1096.slack.com). This week we’ll tackle “things managers say.” If you can’t make it, don’t worry! You can stop by the channel at your leisure to check out all our discussions on pay, performance evaluations and contract protections as well as crowd-sourced information on your Dow Jones benefits. Important Note: This is a separate workspace from the Dow Jones Slack account. If you don’t already have access, send us a note with your personal email address and we’ll send you an invite. *The IAPE contract trivia question is a weekly contest for members of IAPE/DJ bargaining units in the United States and Canada. IAPE officers, IAPE directors, IAPE staff, fee-paying non-members and non-members in right-to-work states (or new employees not yet paying dues to IAPE) are not eligible for prizes. IAPE has a new committee to focus on issues and concerns specific to news-side members. Please contact the news committee at newscommittee@iape1096.org to discuss any issues or ideas or if you want to get involved. IAPE members in sales, it's almost that time of year again. According to our contract, Dow Jones has to give the union 45 days before making any modifications. Directors Cinda Coldwell and Sal Ahmed are heading up the incentives committee and want to hear your concerns and questions about the new plans. Check your inbox for a survey about this year's changes that will guide our response to the company. Another Dow Jones management perennial, annual performance evaluations, is upon us. Your boss may ask you to give a review of your own performance and the company knows where IAPE stands on this--the self assessments are optional and rating the performance of employees is a management function. We want to know how the reviews this round are going and what you think about these subjective appraisals. IAPE's board has approved funding for new two pay-equity studies, with the goal of continuing to bring you tools to help to negotiate for fairer pay. The first study will follow up on our ground-breaking gender-based pay analysis from two years ago to evaluate whether Dow Jones has corrected for a pattern of unequal pay for unequal work, as it asserts. Beyond conducting a follow-up survey, we have also agreed to conduct a study that will go beyond gender and incorporate a broader set of factors. We are developing a questionnaire and you should expect to receive this survey in coming months. Please let us know if you have any suggestions for which additional factors might be worth considering. Especially relevant for reporters: we plan to ask members whether they were originally hired through the newswires, The Wall Street Journal, or wsj.com—factors we believe may cause distortions when setting pay. The 50 or so IAPE-represented Dow Jones employees who will be transferred to a new company -- NewsTech -- are at risk of losing their union protections. This is because when the new entity is formed, union protections will transfer with Dow Jones employees only if half of the new unit’s employees come from union-protected jobs. Currently, Dow Jones employees will make up only 40% of the new company’s workforce, with the rest coming from other News Corp. businesses such as HarperCollins, Move Inc., and others. Congratulations to Joe Palazzolo, a reporter in New York, and Rob Johnson, formerly an editor in New York, who have been named to fill two open Northeast location director positions, and Cinda Coldwell, an account executive, who has agreed to be the classification director for advertising and administration. Congratulations also to Cinda, along with Ali Berzon, a reporter in California, and Tricia Corley, project coordinator for Print-IT in South Brunswick, on being elected to the Executive Council. These elections fill out a seven-person council and help bring geographic and departmental diversity to IAPE's leadership team. Speaking Of Directors . . .
IAPE's newly elected leadership took its first steps toward enacting a bold vision earlier this month. In one of its first actions at its biannual meeting, board members voted to establish a committee to lead IAPE's efforts of rooting out discrimination of any kind at Dow Jones. Led by directors Louise Radnofsky and Lillian Rizzo, the Human Rights/Diversity committee will continue work on the pay equity study. Dozens of employees have already had their salaries adjusted thanks to this groundbreaking analysis, but IAPE contends that inequities with compensation persist. Since this crucial issue requires the dedication of a group of employees that span news and business, IAPE revived the committee with that mandate in mind and is encouraging all members to get involved. IAPE plans to use new initiatives like the Human Rights committee to create a more inclusive and effective union. If we're going to eliminate biases that cause some employees to receive less pay than their peers or investigate claims of editorial interference or keep health-care costs low, we're going to need the support of smart, committed individuals—an abundant resource at Dow Jones. The board also discussed creating an appropriate travel reimbursement policy for the president. In an effort to offer more transparency on how IAPE plans to better address these concerns and for further updates on our progress. The company can raise health-insurance costs for the 2018 and 2019 plan years, but there are limits. According to our contract, Dow Jones can't raise premiums by more than 0.5% of your annual salary in any plan year. Members with POS II Family Coverage, however, noticed that their costs will increase by as much as 0.75% next year. It appears that the company is ignoring the freeze to premiums that came out of our last round of talks. After filing the grievance with Dow Jones, IAPE held a few information sessions to help members better understand our health-benefits protections. While this may seem like a small issue for IAPE to pursue, this is an employee benefit, which means the company is obligated to negotiate any changes with the union. We all want to excel at our jobs and to get along with managers. There can come a time—even for colleagues whom we view as stars—when things get rocky. When you are part of a union, you are entitled to representation. During disciplinary meetings, your IAPE representative has the same standing as a manager, so that any conversation takes place between equals. Plenty of IAPE's work is conducted through our network of volunteer stewards and directors around the continent—we'd love to add your name to the list. Two location directors are needed for the Northeast, the region with the largest IAPE presence. Both will work closely with New York-based location director Lillian Rizzo on building IAPE's engagement with members at 1211, the Bronx printing plant and those working in Boston. Directors keep their ears to the ground on the most important issues for union members and provide help, whether it's answering contract questions or assisting with workplace problems. The directors will work with stewards to lead information sessions and other informal events throughout the year, such as happy-hour mixers and pizza parties. No previous experience in the union necessary and directors are eligible to participate in IAPE-sponsored training. Please reach out to Yogi Patel and Lillian Rizzo if you're interested in learning more about the role. Members will help chairs on IAPE projects related to pay, promotion and diversity. Chairs will provide recommendations to labor-management and grievance committees for presentation to Dow Jones on any issues involving inequitable treatment of members based on gender, race, ethnic background, religion, sexual orientation or union activity. Contact Louise or Lillian to volunteer for this committee. Please reach out to Siobhan or Yogi if you have any questions or are interested in helping out with any IAPE projects. Talk to you all in the new year!